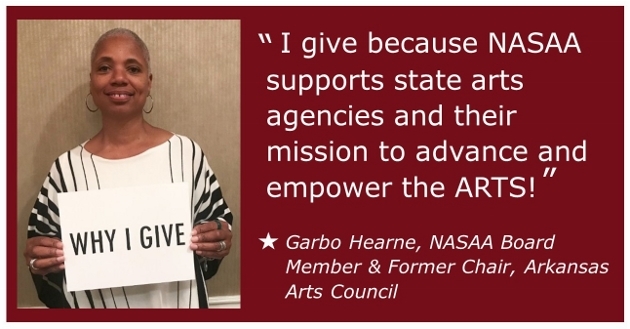 Donate to NASAA - NASAA NATIONAL ASSEMBLY OF STATE ARTS AGENCIES | You Can Keep the Arts Strong! You Can Keep the Arts Strong! You create a powerful ripple effect when you support NASAA. You help give state arts agencies the tools to keep the arts alive in our communities. With your support, NASAA provides state arts agencies with vital advocacy, research, leadership training and representation in Congress. Your gift empowers state arts agencies and protects public funding for the arts—so that everyone and every community benefits from the arts. Thank you!